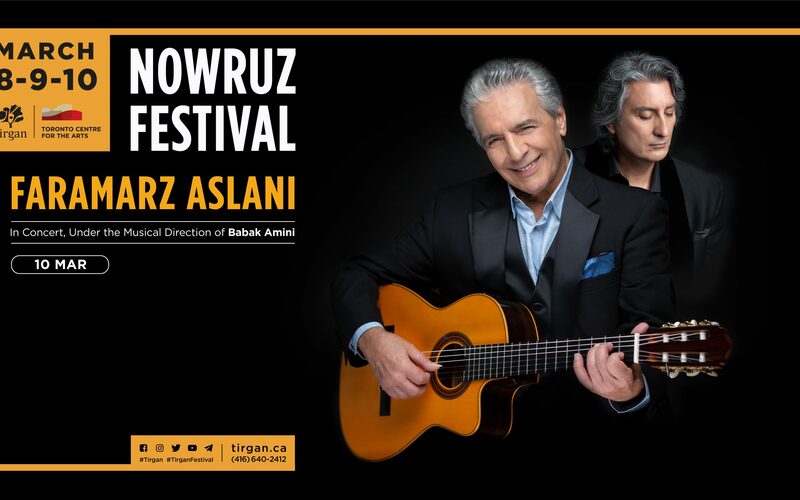 Persian music is refracted across generations in this exceptional triple bill anchored by legendary singer-songwriter and guitarist Faramarz Aslani. Beloved for setting classical Persian poetry and original lyrics to pop grooves, Aslani has been one of the most respected Iranian artists since his 1977 hit song “Ageh Ye Rooz” (If One Day). Faramarz Aslani’s stylish guitar playing and singing has made numerous fans and followers for him. He has been one of the most respected musicians among Iranians since he introduced himself by his hit song “Ageh Ye Rooz…” (If One Day…). Through 40 years he has made, produced, and performed music in a variety of musical genres and styles from Middle Eastern pop to acoustic jazz. Aslani started as a journalist for several Persian and English publications, after he graduated from London University’s College of Journalism in the early ’70s. He used to work at the Tehran Journal for years but moved to CBS in late ’70s. Joining CBS was a critical point in his musical life, since he could get the opportunity to publish his first album, Ageh Ye Rooz… (If One Day…), in the late ’70s, which attracted much attention. The title song became one of the greatest Iranian music hits. Perhaps the most important element that made Ageh Ye Rooz… a unique album was that the songs were arranged for two, and in some songs three, Spanish guitars as main instruments. This had been rarely seen in Iranian music before. His second album, Be Yad e Hafez (Hafez, a Memorandum), was also recorded for the same label. Be Yad e Hafez was a tribute to Hafez, a great Iranian traditional poet, and showed Aslani’s deep respect to him. The album consisted of eight songs written for eight poems of Hafez. After the Islamic Revolution in 1979, Aslani with his family, like most of his colleagues, left Iran and headed toward England, where he continued both as a journalist and a musician. In 1992 he started a U.S. tour which was opened at the Shrine Auditorium in Los Angeles and attracted much attention by eager Iranians all over the U.S.
Aslani released his third album, Rooz-haye Taraneh va Andooh (Days of Songs and Sorrow), in 1999, about 20 years after Ageh Ye Rooz… The album is comprised of songs that are quite diverse, both in style and concept, some lyrics of which belonged to Aslani himself. In Rooz-haye Taraneh va Andooh once again he showed his respect of traditional Iranian literature and used Rumi’s well-known poem called “Beshno az Ney” in the song “Listen to the Tale.” In 2003 he released another tribute album, Rumi, with Dariush and Ramesh, which consisted of 13 songs written for 13 poems of Rumi, or Molana Jalal-e-Ddin Mohammad Balkhi, a traditional Iranian poet as well as a mystic who lived in 13th century (about hundred years before Hafez).